Get up close and personal with the ‘Smoke that Thunders’ on a Victoria Falls safari with Springbok Atlas. Explore the historic Victoria Falls village and its wild, unspoiled surrounds in Zimbabwe. Experience the most classic, awesome views of this world-renowned natural phenomenon when you tour Victoria Falls with us on a guided walking safari. We’ll take you through the tropical, spray-drenched rainforest to the best vantage points of this World Heritage Site. Our Victoria Falls safari includes a sunset cruise on the mighty Zambezi River with its hippos, crocodiles and riverbank game viewing. 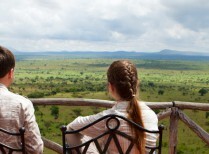 Plus, you can enjoy plenty of leisure time to explore more Victoria Falls activities. 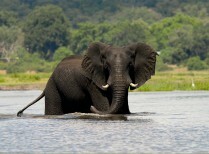 Chat to us about a Victoria Falls safari today. Prices exclude all airport, departure & fuel taxes (approx. USD 331 pp, subject to change). You leave Johannesburg on a mid-morning flight. 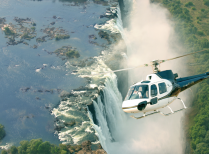 Experience your first intriguing glimpse of the Victoria Falls from the air before you touch down at Victoria Falls Airport. You are met and transferred to your hotel. You have the rest of the day at your leisure to explore the town or enjoy the many activities and attractions on offer. Experience your first intriguing glimpse of the Victoria Falls from the air before you touch down at Victoria Falls Airport. After breakfast, the Victoria Falls will take your breath away on a guided walking safari that takes you through the magnificent spray-drenched rainforest with its extraordinary plants and birds. 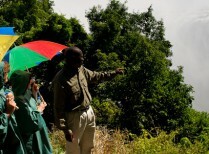 You experience and photograph all the classic and best views of the Falls, the Cataracts and Livingstone’s statue. As the only hotel on the Zimbabwean side of Victoria Falls with river frontage, A’Zambezi River Lodge offers unique views of the mighty Zambezi River with it hippo and crocodiles, before its waters tumble over into deep chasm of First Gorge. Fondly known as the “Grand Old Lady of the Falls’, the Victoria Falls Hotel is one of Africa’s most celebrated and nostalgic hotels. Overlooking the expansive wild plateau of the Zambezi National Park, the luxury Victoria Safari Lodge is just four kilometres from the thundering Victoria Falls. With tasteful African-inspired décor and finishings, the stylish en-suite rooms all have private balconies with spectacular bush views. Fondly known as the “Grand Old Lady of the Falls’, the Victoria Falls Hotel is one of Africa’s most celebrated and nostalgic hotels. Built in 1904, in the gracious Edwardian style of the colonial era, this 5-star luxury hotel which offers every modern convenience is set in lush sub-tropical gardens within the Victoria Falls National Park. The ‘smoke that thunders’ is less than a 10 minute walk away along the hotel’s private pathway, and is both audible and visible from the landmark hotel itself. Stanley’s Terrace, long a famous rendezvous for Africa’s adventurers, offers clear views of the Victoria Falls Bridge, part of Cecil John Rhode’s ambitious plan to build a railway line from Cape to Cairo. The ambiance and grandeur of the Victoria Falls Hotel is as unforgettable as the sights and sounds of the spectacular waterfall.